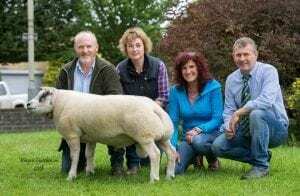 The Premier Sale at Harrison & Hetherington Mart 15 -17 August 2018 saw a new Beltex breed record set of 65,000gns for a shearling ram sold by Neale & Janet McQuistin of Newton Stewart. Their homebred entry, Airyolland Castro, a son of Airyolland Asulam and out of a homebred dam by Corstane Max. Airyolland Castro – New Breed record of 65,000gns, with vendors Neale & Janet McQuistin and buyers Paul & Christine Tippetts. 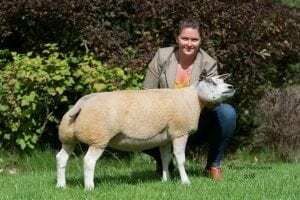 Airyolland Castro went home with Paul & Christine Tippets to Shifnal, Shropshire to join the previous breed record holder Topflite Al Pacino. Also joining the Hackney & Wilodge flocks was the pre-sale Show Reserve Female Champion and top price gimmer shearling Heber Park Carmen a homebred entry from DW & KCB Shuttleworth, Skipton is a daughter of Buckles Balmoral. 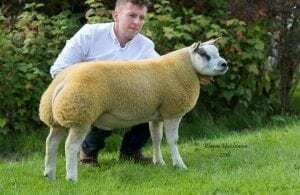 Supreme Champion Matt’s Ducati a Hackney Corker son from Matthew Burleigh, Co Fermanagh, this is the only and first ram lamb to be offered for sale of the multi award winning ewe Matt’s Actress went down for 10,000gns and few lots later came the second 10,000gn bid lamb, Clary Desperate, a Henry V/H/Vrijbos bred son from Jock Macmillan, Newton Stewart.